Sorry about the break in entries to this blog. It seems the world got super busy for a bit (and there’s not much to report about the research vineyard in August/September when there are no grapes to harvest). Since the last entry to this blog, the HCC staff has grown. Dylan Rolfes has joined our team as the vineyard manager and viticulture instructor. He recently graduated from Iowa State University with a master’s degree in Horticulture (emphasis in Viticulture). Dylan and I walked through the vineyard today and noted several things about the vines as the weather has begun to cool off. I’m handing off the blog to Dylan to make entries from this point forward. Thanks to all for the kind comments and not giving me too hard of a time about reporting observations without having a formal education in Vit. Good Luck to Dylan, and I hope everyone enjoys his writings here!! 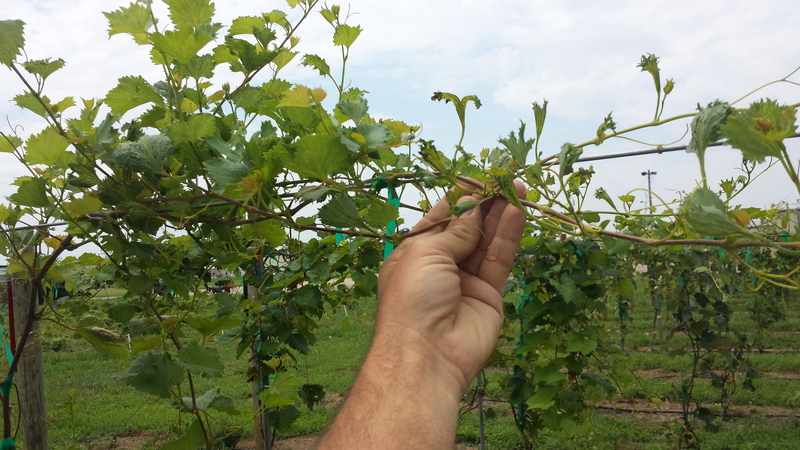 On October 2, 2014 Scott and I inspected the research vineyard for 2,4-D damage from the previous season. 2,4-D is the common industry name for 2,4-Dichlorophenoxyacetic acid, a synthetic auxin based general broad leaf herbicide. This is a very common herbicide used in pastures, cereal grain crop, and lawn and turf areas for broad leaf weed control. The mode of action for this herbicide is systemic (meaning that it will be absorbed through the leaves and translocated to the meristems of the plant tissue, eventually causing unobtainable growth rates, leaf curl-over, and potential vine death). Rougeon vine approximately one month after drift event. Note the distance between nodes on the left part of the photo versus the right. 2,4-D is also very susceptible to spray drift from neighboring fields, especially in hot and/or windy weather. This can be a very serious problem for grape growers, especially in the Midwest, where cereal crops and pasture land often surround our vineyards. The best methods for preventing drift damage from 2,4-D out of neighboring areas is to maintain good communication with neighbors, and to let them know that you are growing a crop that is highly sensitive to 2,4-D and that extra precaution should be used while spraying. Using a tree line as a wind break may also be an effective method for protecting a field from drift damage, but this should be considered in conjunction with the necessity of good airflow through the vineyard to mitigate the threats of disease and frost damage associated with stagnant air. One obvious tactic to prevent 2,4-D damage to your grapevines is to plant varieties that are resistant to 2,4-D damage. the following table shares our findings in the research vineyard as of October 2, 2014. Table 1. 2,4-D Damage to Research Vineyard October 2014. 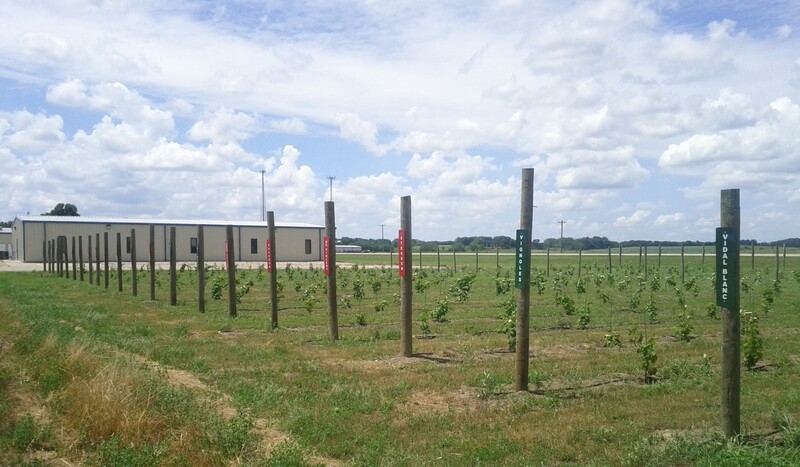 Column 1 lists the cultivars grown in our research vineyard. Column 2 refers to the initial damage caused by drift from nearby fields that took place in early-mid June. ‘Y’ means that ‘yes’ 2,4-D damage was noted on the older leaves of these vines. ‘N’ means that ‘no’ such damage was noted. ‘Slight’ means that the damage was minor compared with other cultivars. Column 3 notes whether or not the vines recovered from the 2,4-D damage and began to produce regular shoots and leaves again later in the season. Column 4 notes a second drift event that we believe to have taken place near our harvest time in late August to early September. This event was noted as very young leaves, definitely not present during the first drift event, with signs of recent 2,4-D damage. Notice that several cultivars were injured by the initial drift event, recovered mid-season, and were then injured again by the second drift even (see Zweigelt for example).